Since its humble beginnings as a simple clipboard for text snippets, SnipNotes has evolved into a comprehensive note-taking app and is chosen by more and more users as their primary notepad. One of SnipNotes’ biggest remaining limitations is that notes can only contain plain text and no other elements. The next updates are aimed at filling this gap. Here is an overview of the current development plan. The first update in this series is already nearing completion and will be released in the coming weeks. It focuses on the introduction of various formatting options. 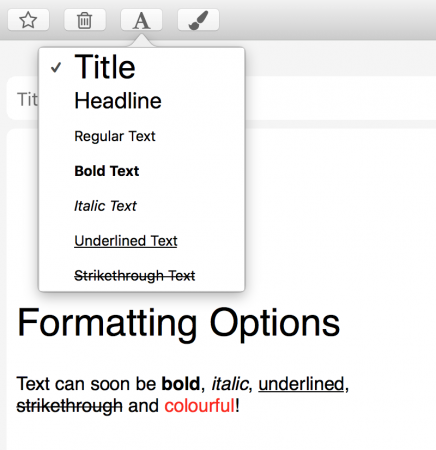 Text can be displayed in bold, italic, underlined and strikethrough. There are various headlines to arrange notes in sections. Furthermore, there will also be multiple text colors available. Formatting options can be selected on a formatting bar, via keyboard shortcuts or entered directly in markdown syntax. Markdown is also the format used to save notes in SnipNotes, which enables an easy exchange between multiple devices and apps. For example, you can paste markdown text from another app into SnipNotes, which will be rendered automatically. The second update focuses on the creation of lists. There will be numbered lists, bulleted lists as well as lists with checkboxes, which can be ticked off. SnipNotes already supports the storage of images, but so far they can only be saved as separate notes. One of the next updates is going to remove this limitation and allow the insertion of images inside text notes. What else would you like to insert into your notes? Do you miss tables, attachments or drawings? Please drop me a line at features@snipnotes.de or on Twitter. I’m looking forward to your ideas! This entry was posted in General on 07/03/2018 by SnipNotes.